We produce spectacular, high-impact outfittings that make products stand out and engage consumers. Today’s consumers’ habits and behaviours have changed: consumers are better informed, buy on the move and are content to explore various kinds of POS. Flagship stores, concession corners, department stores, travel retail stores, free-standing stores, outlets, shops-in-shop. The actual locations for shopping have multiplied and taken on various forms. From monobrand shops to large deparment stores, BRANDS have had to adapt and redefine the spaces they occupy in order stand a chance of being noticed. At PROMA we are very well acquainted with the unique characteristics of the various sales channels. We devise the best product display strategies to give the BRAND appropriate visibility. We know how to make a bottle of perfume stand out. We know how best to light a chromatic eyeshadow palette. And we know how to make a product fascinating and appealing, because we understand the workings of psychological techniques and neuromarketing as well as how these act upon a product’s symbolic and value-based attributes, driving an impulse to buy. We have the know-how to reinvent retail spaces using design, innovative forms and materials and display layout optimisation for more easily accesssible and barrier-free communication, guiding the public into a new narrative of experiences. We operate in Fashion & Accessories, IT & Electronics, Eyewear, Beauty & Cosmetics and Healthcare, assisting BRANDS throughout all planning processes and supporting retailers in their daily display needs. A distribution channel par excellence for make-up, perfume and cosmetic products. A temple of beauty, where image matters far more than the arrangement of the actual contents on display. A world in which product display and the juxtasposition of forms, colours and materials truly do make all the difference. Healthcare is a wide distribution channel which, in addition to a typical herborist’s shop or pharmacy, includes new formats and special corners dedicated to cosmetic beauty and personal care. Important new developments in layout, set-up and display furniture accessibility are currently sweeping through the pharmaceutical sector. Visual merchandising is becoming an essential communication tool on the shelf and on chemists’ shelf talkers and is crucial to making display cabinets more interesting and attractive. From clothing to accessories, we have every category in the sector covered: footwear, belts, bags, tied, total look and corner sales points dedicated to just one product. Glasses for all occasions: sunglasses, spectacles and accessories. Franchising chain stores or independent sales points. Display solutions for walls or rotating totems. PROMA’s display solution designs for product lines or complete furnishing solutions boost BRAND value. Technology is now an integral part of our daily lives. The market for tech accessories is fast moving and stays hot on the heels of the consumer with constantly updated technological needs and the latest versions of products which must therefore be able to stand out appropriately against existing wares. 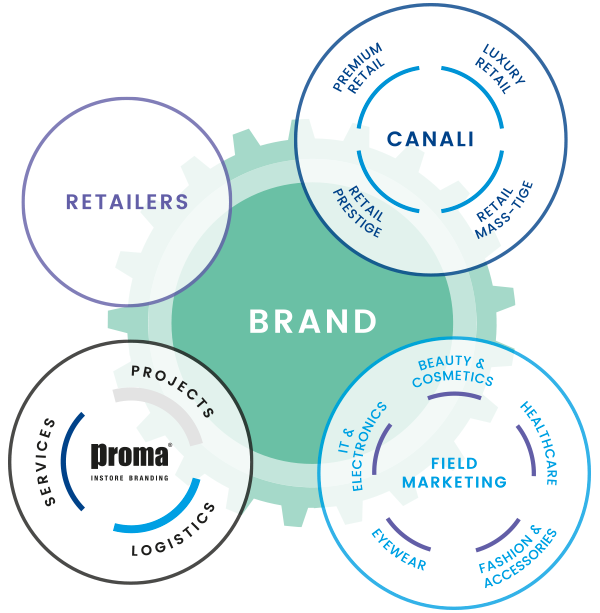 PROMA has the right know-how to open the eyes of the consumer to electronic and technological products, leading them towards certain aesthetic trends and BRAND lines.